The Narkomed MRI is a unique anesthesia system. It is the sole machine with an integrated ventilator and VPO monitor designed and engineered to perform without distance or electromagnetic restrictions in shielded or unshielded MRI environments of up to 3.0 Tesla. This feature enables operation with minimum space required between the patient and the machine. This space advantage can be a very relevant consideration when scanning pediatric and neonatal patients. The strong magnetic fields which generate detailed patient images can be the source of substantial problems with standard anesthesia equipment. Even in direct contact with the MRI, the Narkomed MRI works dependably and creates no detectable image distortion. The Narkomed MRI combines an integrated electronic ventilator and an integrated exhaled volume, airway pressure and oxygen monitor in one compact unit. The Narkomed MRI anesthesia system employs magnetic resonance imaging. The unit features the proven reliability of the AV2+ ventilator, a single vaporizer mount for 19.1 style vaporizers and the CORm volume, pressure and oxygen monitor on first generation units. The second generation machines utilize Drager GS type display with oxygen, volume, and pressure monitoring. The absorber assembly conveys the familiar Narkomed feel in an MRI compatible model. 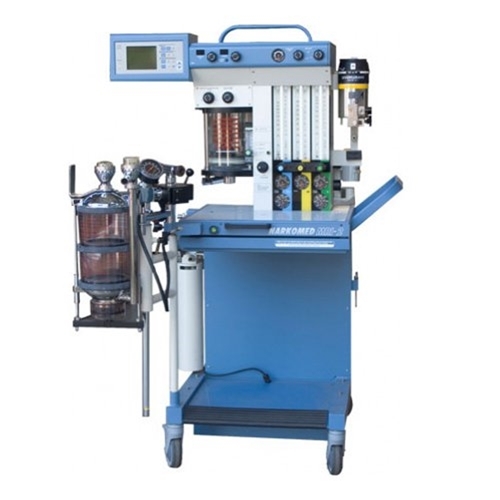 This anesthesia medical equipment is small and has been tested in the vicinity of the strongest magnets. Ventilator: Ascending bellows pneumatic double-circuit AV2+ style ventilator without tidal volume compensation. Modes volume control (VCV), Manual/ Spontaneous. Mechanical bag/vent switch. Machine checklist: Manual FDA-style checklist. Flowmeters: Traditional needle valve with glass flowtube display. Breathing circuit: Traditional absorber head. The breathing circuit is higher volume (dual absorbent canisters). May use loose granules or prefilled canisters. May be used with non-rebreathing circuits. Electrical power failure: Most functions except patient monitoring are preserved during power failure, as this is a basic pneumatic-mechanical machine. System operates with 120 VAC @ 50/60 Hz electrical source. Regulator assemblies and yokes for external O2 and N2O cylinders. O2, N2O and Air hoses for connecting pipeline sources to DISS machine connections. Testing done with unit touching the MRI.